May this year, 2017 marked the 30 th Anniversary of the opening of London City Airport in East London. Over the last thirty years the airport has seen over 55 million passengers pass through its arrival and departure gates. Last year in 2016 City Airport handled a record 4.5 million passengers with over half of them being business passengers. So despite the uncertain political times we currently find ourselves in the appetite to travel to from the heart of London for business or pleasure has not diminished. City Airport is situated on the quay between the Royal Albert Dock and the King George V Dock. 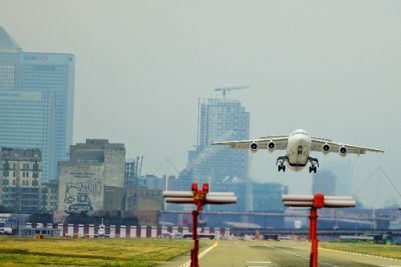 The idea of having an airport here was first proposed in 1981 by Reg Ward, who was CEO of the newly formed London Docklands Development Corporation (LDDC) that was tasked with the regeneration of the East London area around the docks after it had been closed to commercial cargo vessels. As plans gathered pace to redevelop the area in June 1982 for the STOLport (Short Take Off & Landing) project, a landing by a de Havilland Canada DHC-7 Dash 7 turboprop aircraft on Heron Quays, in the nearby West India Docks was arranged to demonstrate the possibilities of an airport. After further consultation surrounding the feasibility of building an airport in London’s docks and the impact on the local community in the East End. Construction finally got the green light to go ahead. In May 1986 Charles Prince of Wales laid the foundation stone for the airport terminal designed by designed by R Seifert and Partners. In October 1987 the first commercial flight landed from Plymouth operated by Brymon Airways. This was followed a short time later by a further service operated by Eurocity Express from Brussels. Both carriers using De Havilland Dash 7 aircraft designed for short take-off and landings. In November of the same year the Queen officially opened London’s City Airport. The first entirely new airport to be constructed in the UK for 40 years, taking just 18 months to build at a cost of £34 million. By the end of 1988 London City Airport had handled over 130,000 passengers. Seven years later it had reached some half a million passengers and by last year a record 4.5 million passengers had passed through the airport. Flights from City Airport currently depart to over forty different destinations in both Europe and the USA with the most popular destinations being Amsterdam, Zurich, Frankfurt, Rotterdam and Dublin. With expansion plans already in place to increase the size of the airport’s terminal, improve passenger facilities, build additional aircraft stands and upgrades to the public transport system with the possibility of including a Cross Rail Link in the future the numbers of passengers estimated to use City Airport is set to increase to 8 million by 2030.